When you land on the island, you will be on Main Street, standing on top of a sign that says “County Prison.” Jump off of the sign, and go right, into a building labelled Comic Shop. Once inside, go right, and there will be a poptropican with large glasses and blonde hair. Talk to him for a little bit, and he will give you a handwritten handbook. Go to your items, and read through the handbook. It will tell you that you need to get a superhero ID card and also give you tips and pointers on how to be a good superhero. Exit the comic shop. Go right, and enter the building labelled Masks and Capes. To the left will be a man in a pink shirt. Click on him, and he will give you a Superhero ID Card. To the right will be a selection of mannequins with different superhero costumes on. You can either choose one, mix and match, or just take a couple accessories from each. That part is optional, but it will make you look like quite the official superhero. Exit the costume shop. Go right, until you’re outside of a building labelled The Daily Paper. Jump onto the sill of the window either to the right or left of you, and then onto the ledge directly above you. There will be a lift going up and down. Wait for it to come down, jump on it, and let it carry you up to the top of the building. Jump up, and talk to the old looking superhero in red. He’ll tell you to come talk to him after you’ve defeated five villains. Go back down the building. Go left, and keep going until you cross a body of water. You will arrive at a prison with a large green meteor lodged in the side. Go left and talk to the Poptropican with grey hair and a mustache. He will give you the top-secret Super Villain Files that will give you information about all of the escaped prisoners. Examine the files to learn more. Go left a little more, and talk to the poptropican with blonde hair. She will give you information on the escaped villains and Anti-Power Handcuffs. Once you’ve caught all of the Copycats, a newspaper will pop up. Exit out of the newspaper, and you will be transported back to the prison. Go all the way right, to the next area. Go right, past the bank, and past the skyscraper. There will be steps in the sidewalk leading to the subway. Go down them. Once inside, go right and enter the train. Speeding Spike (See Super Villain Files) will be in the train car to the very right. Go to that train car, and when he makes an angry gesture, that will signal that e is about to run at you. When he does, jump over him. He will do this a couple times, and then go to the next car. Repeat the process until he slips on a puddle in the first train car. When he does, walk over to him, click on him, and you will put the handcuffs on him. Another newspaper will pop up. 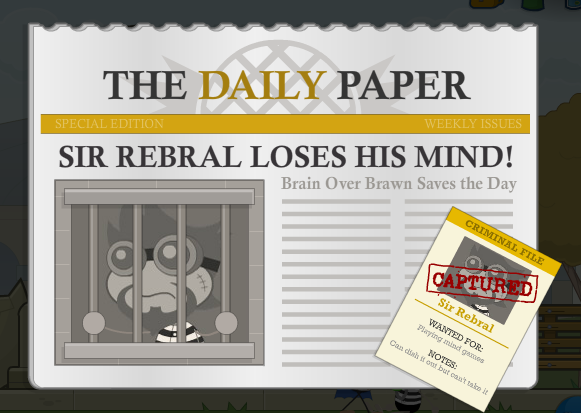 After you exit out of the newspaper, you will be transported back to the prison. Go right, back to Downtown (the area the bank and subway were in). Keep going right, to the area marked City Park. 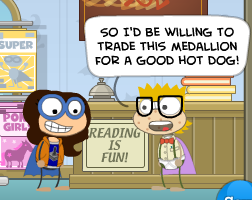 To your right will be a poptropican selling hotdogs. Click on him, and he will give you one. Further to the right will be Sir Rebral (see Super Villain Files). He will be using his telekinesis to send rocks after you. It will take some jumping around, but you will need to get the rocks so that you will hit him with it. After you do that, he will start making patches from the ground pop up and knock you into the air. To the right, in front of the bathrooms, will be a small boulder. Push it to just a little to the right of the statue Sir Rebral is standing on it, and wait for a plot of ground do pop up. The boulder should hit Sir Rebral and knock him out. If it doesn’t, experiment around with where you put the boulder until it hits him. Once he’s knocked out, click on him and you will put anti-power handcuffs on him. Then the newspaper will pop up. Exit out of the newspaper, and you will be transported back to the prison. Go back to the park. 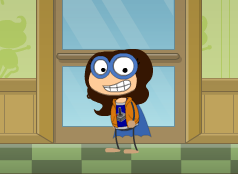 Enter the bathroom, either the one for boys or girls depending on the gender of your poptropican. On the floor will be an opening to a sewer. Go down, and you will be in the sewer entrance. Go left, off of the platform that you’re currently on and into the water. Swim left until you get to a floating thing that’s in front of a pipe with a wheel on it. Jump onto the floaty thing and click on the wheel. The water level will start going down. When it stops, go right and click the wheel above the steps. The water level will increase enough for you to reach the wheel on the middle pipe. Click on it, and the water will be raised enough for you to swim all the way left and enter through a door on the top of the ledge. Once through the door, you will be in a room with Ratman (See Super Villain Files). Go left, and jump on top of the shed thing. Jump onto the next pipe, careful to avoid the rat, and then onto a brown pipe to the left, avoiding the next rat. Jump onto the silver pipe, avoiding that rat, and onto the brown pipe with no rat. Click on the red wheel, and green slime will gush out of the sewer, knocking out Ratman. The flies around him will then follow you. Be careful not to get stung by them, because they will knock you off of where you are. From the brown pipe, jump left onto the silver pipe, onto the higher bit of silver pipe, and onto the same pipe as Ratman. 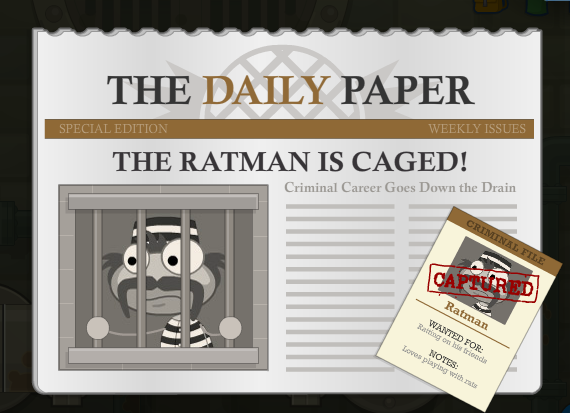 Click on him, and you will put handcuffs on him and the newspaper will pop up. Exit out of the paper, and you will be brought back to the County Prison. Go back to the park, and then keep going right, into the junkyard. Crusher (see Super Villain Files) will be on top of a car, stomping and growling. Go right, and jump onto the fence. From there, jump onto a pile of tires, then onto barrels of oil. Jump onto the car that Crusher is on, then over to the large yellow tower. Climb up the tower and then click on the two levers inside. Pull the magnet control lever down, and the refrigerator will fall on Crusher. Crusher will then lift it, and throw it on you, knocking you off of the tower. Make your way back to the top of the tower, avoiding the barrels Crusher throws at you. Click on the levers again, and pull the magnet control back up. The hood of the car will be attracted up, bringing crusher with it, and knocking him out. Go back to Crusher, and click on him. You will put handcuffs on him, and the newspaper will pop up. Exit out, and you will be transported back to the county prison. Go right, and go back up the Daily Paper tower. Talk to the old superhero again. He’ll tell you to find what you need in the phone booth. Go back down the tower, and click on the phone in the phone booth to the left of the tower. You will gain the power to fly. 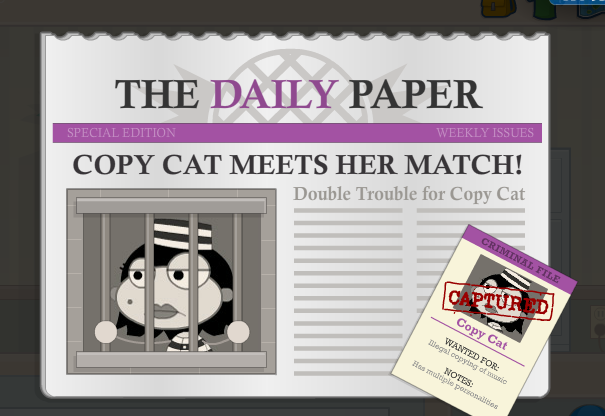 To toggle your power on and off, click the blue poptropican in the corner of your screen. Go back to Down Town. There will be a tall skyscraper next to the bank. Fly all the way up, and Betty Jetty (See Super Villain Files) will be at the top. She will fly off into the sky, and you will need to fly after her and get close enough to her to knock her out of the sky. She will periodically send out green orbs, which you will need to dodge because if they hit you enough times they will knock you out of the sky. Once you knock her out, you’ll both fall out of the sky and land on the skyscraper. She’ll threaten you, and then Ned Noodlehead will come in and knock her out, calling himself “your trusty sidekick.” Click on Betty Jetty to put anti-power handcuffs on her, and a pretty controversial newspaper will pop up, calling Ned Noodlehead the island hero. Exit out of the newspaper, and you will be transported back to the county prison. 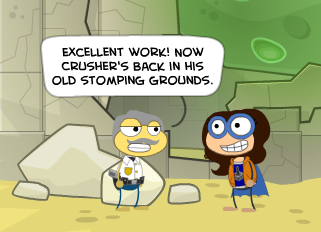 The Poptropican with grey hair and a mustache will tell you he gave the island medallion to Ned. Go right and enter the comic shop. Click on Ned, and he will tell you that he’s willing for a trade. Click here’s a hotdog, and he will give you your medallion.